SARGANT, William Lucas. 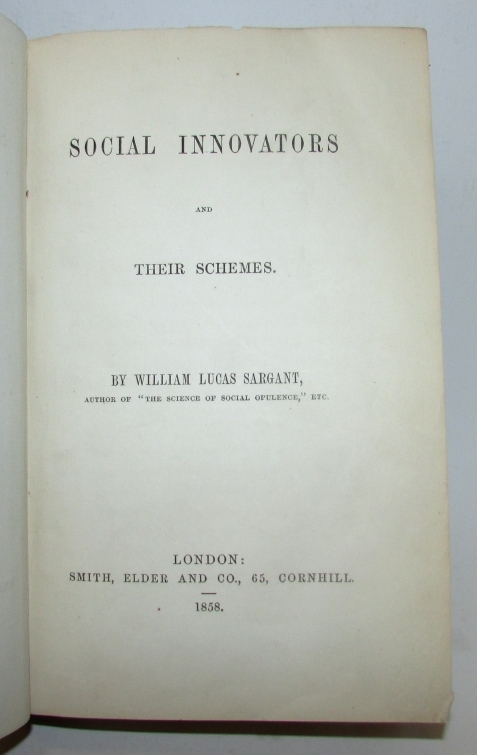 Social Innovators And Their Schemes. London: Smith, Elder and Co., 1858. First edition. 8vo., original green cloth, (xvi), 468, 16pp. ads dated ‘November 1858.' Bookplate of the Fraser Institute on the front pastedown otherwise a fine copy. The author outlines the ‘schemes' of those who have attempted to ‘promote the well-being of the most numerous, and least fortunate, classes of society.' Curiously, Sargant opted to only include those people whose schemes have failed. Those covered include: Saint Simon, Fourier, Louis Blanc, Proudhon, and Emile De Girardin.